A lot of people like full-size pickup trucks. I’m not one of those people, of course, because I have all my teeth. But I saw several Ford F-150s today, and they looked pretty sharp, so I’m going to make it the next New Car Review Without Actually Driving It. Let’s get one thing straight right away: the Ford F-150 isn’t the most popular vehicle in America. That honor goes to the entire Ford F-series, which includes everything from the crew cab pickup driven by your heavily tattooed neighbor to the ambulance that shows up when his wife shoots him in self-defense. It also includes the Ryder truck she’ll use to move out, and the tow truck that will come to repossess his jet ski. But even though the F-150 isn’t as popular as the entire F-Series, it’s still really common. To find out why, I’ve decided to review it while sitting at a Five Guys so I can examine the kind of people who eat large burgers, which are also the kind of people who drive large pickups. Perhaps I can channel their thoughts to provide a thorough, complete review. Also, the free peanuts are pretty good, and I’m picking up WiFi from the Papa John’s next door. The exterior styling of F-150 pickups seems to go in waves. In the 1980s and early 1990s, it looked really mean and hulking until they redesigned it in 1997 and it got all round and girly. But then they redesigned it in 2004, and it became really muscular and nice looking again. They claim they’ve redesigned it again since then, but really they just changed the taillights. Or, if measured by 2012 Toyota Camry standards, it’s all-new from the ground up. The good news is, the truck that came out in 2004 is handsome. It’s got clean lines, it still looks fresh, and it’s a lot nicer than competitors. Of course, that’s not saying much, since the overstyled Dodge Ram looks like the kind of thing a cartoonist might throw out for being too unrealistic, and the dull Chevrolet Silverado was clearly the result of a contest where designers could only use a ruler. Toyota and Nissan also have entrants into this segment, but only so their employees can tow stuff on the weekends. 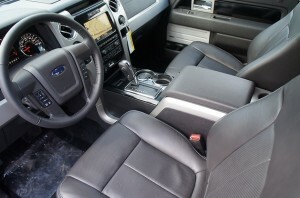 Since I’ve never actually been in an F-150, it’s tough to judge the interior, but I’m going to do it anyway. After a quick Google Images search, the cabin’s two main selling points are obvious. One is size. It’s got huge seats, a huge dashboard, a huge steering wheel, and huge panel gaps, which are probably useful for discarding trash, or perhaps storing musical instruments. If Buffalo Bill had an F-150 in The Silence of the Lambs, he would’ve hidden the senator’s daughter between the radio and the steering column. The second selling point of the F-150 interior is dullness, or what Ford would probably prefer I call “functionality.” The interior is remarkably straightforward, and lacks any personality. Not that I’m complaining – it’s a truck, after all. There’s one exception: the pickup’s tiny, circular air vents which are incredibly dainty and look like they produce about a tenth of the air needed to cool or heat the cabin. The rest probably comes out the panel gaps. 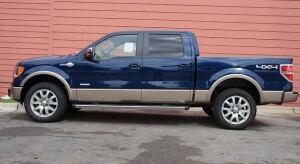 Being a large pickup, the F-150 drives like all other large pickups. In other words, you’re high off the ground, the steering is vague, and at any given time you have no idea where the entire truck is. You could be driving down a street fully aware of your surroundings, but your rear bumper is two blocks back ordering at a Wendy’s drive thru. Seriously, it’s that big. A SuperCrew F-150 is 237.1 inches long, or five feet longer than a Honda Civic. It’s also ten inches wider, and – get this – almost two feet taller. Lesson: if you have an F-150, don’t let your Civic-driving friend borrow it, because he will back into something. 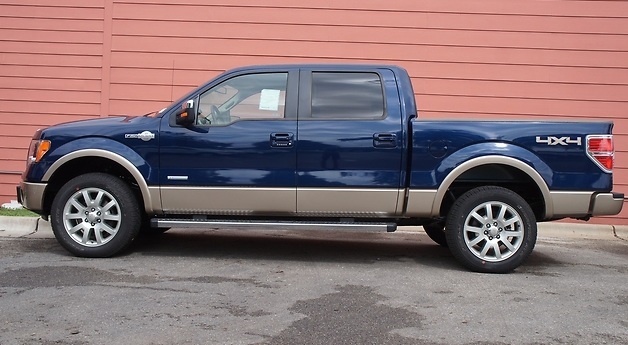 It’s not beautiful, it’s not exciting, and it’s not a sports car, but it’s hard to argue with the F-150 for practicality – especially considering the millions Ford has sold. But if you get one, I suggest you eat as many meals as possible at Five Guys, just like the people around me. It’s the only way to make sure you won’t get stuck in the panel gaps. This is some of most hilarious, sharp writing about cars I’ve ever read. You may not have the reader base yet, man, but keep up the good work. Really enjoying your dry, sarcastic style. It’s witty and sardonic without being annoying, and car journalism could use more of this kind of stuff. I only recently drove my first F-150, but we have basically the same theory regarding the panel gaps – I used the a space in the dash to hold my work gloves while driving. 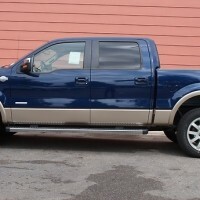 I used to work as a valet parker and I can say that the f150 is the best full size pickup on the market. They actually drive significantly better than the GMT900s or the Ram. The interior is a very nice place to be when loaded up with all the goodies, and don’t get me started on the King Ranch model. And parking is a cinch even without the backup camera. If I had 50 grand to burn, and another spare 50 grand annually for gas, I would definitely buy a gussied up crew cab for my daily driver. I once borrowed a friends F-150 CrewCab to move a bed, as I was leaving his house, he told me I would want one after driving it. I returned it with a look of disgust on my face and happily took back the keys to my Legacy wagon. It’s nice to KNOW someone with a full-size truck, but I’ll stick to cars, thank you very much! Awesome write-up. I really enjoy your writing style. “If Buffalo Bill had an F-150 in The Silence of the Lambs, he would’ve hidden the senator’s daughter between the radio and the steering column.” That’s probably the single best sentence I have ever read in an automotive review.